is really a young prospect but has been around a while but who has been off most people's radar for the last couple of seasons. Got that? Good. Said prospect is none other than Wisconsin Native and LAX'er Richard Seidel, better known as R.J.
From La Crosse, Wis., Seidel was drafted in the 16th round of the 2006 amateur draft (see what I'm saying, been around a while). 2013 marked his seventh professional season, all spent in the Milwaukee Brewers farm system. He's been around long enough to have played A-ball with the West Virginia Power (fun fact: also on that team were Jonathan Lucroy, Logan Schafer, Caleb Gindl and Rob Wooten). So what took so long? Injury for one, before the 2009 season he tore his ACL when he slipped on ice. He would only throw 57 innings that year and did not look sharp in the process - Seidel had an ERA of 6.79 combined between the Arizona League Brewers and the low-A Wisconsin Timber Rattlers. The following season he opened the year in the starting rotation for the High-A Brevard County Manatees and struggled some before moving into the bullpen, which turned out to be a good move for him. 2010 saw him finish with a 3.70 ERA in 65.2 innings pitched. Solid, but not spectacular. 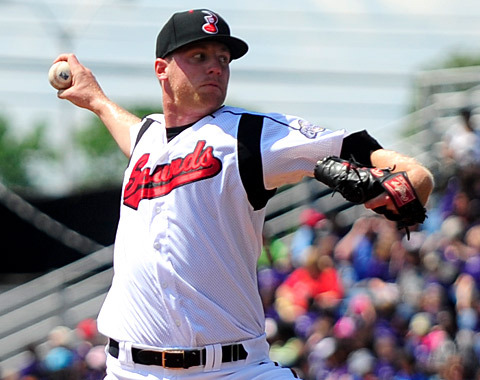 It took Seidel a couple shots at double-A to stick and he earned a promotion to Nashville early this season. Once there, whether by necessity or demand he found his way back into the starting rotation. And, aside from one bad month, he has had a pretty impressive season. To start us off, let's take a look at his month by month splits. In May Seidel had a 3.51 ERA, in June - 10.20, in July 3.48 and here in August he has yet to give up a run in either appearance. If you take away that atrocious month of June you would consider this a breakout season. The strikeout numbers aren't too bad either, he's struck out 94 batters between a brief stint at double-A and triple-A spanning 88.2 innings. The strikeouts are a career high and the inning count is his highest since his 2008 season. It's a limited return to the starting rotation but results are results. Durability might be an issue, this is a player that's only gone over the 100 inning mark once in his career. He's been used sparingly in August so it's unlikely we'll see him go over that mark this year either. His role is another question, Seidel has had success as a reliever at times and as a starter at times. While his numbers with Nashville this year are promising, that one bad month was REALLY bad. In June Seidel made five appearances, pitching in 15 innings. In those 15 innings he managed to give up 17 runs and walk 12 batters. His ERA was a less-than-stellar 10.20, yikes. The consistency just wasn't there. This was also the first season he saw extended action in the starting rotation since 2010. This is a tough one to get a read on, which usually isn't a good sign. Seidel seems to be a player that will be able to contribute at the major league level but in an as yet determined role. In the immediate future, assuming he remains with Milwaukee, he should be given a chance in the starting rotation with Nashville. When you consider the lack of near majors ready pitching prospects and the struggles of Taylor Jungmann and Drew Gagnon with double-A Hunstville this year, any pitcher whose shown some flashes of success at a higher level should be given a chance to realize that. Whether the organization decides to do that or not is anyone's guess. In the event that the organization wants him in a relief role in 2013 I would expect to see him receive an invite to major league spring training with a chance to earn a spot in the bullpen (slim chance, but if you don't make it and you pitch well in the minors your name will likely be the first called - example Donovan Hand). The story has the potential to be a good one, he's a Wisconsin kid who has worked his way up the minor league ladder. Overcome bad luck, overcome some bad seasons and now has the potential to be a perfect example of Doug Melvin's patience paying off. I'm rooting for him. ACL injury occurred during an alumni basketball tournament. Ice was never a factor.